How can they make it free? Does it really have the same services as the original? Could I save money by trying something new or will I get myself into a huge mess? That's what everyone has been wondering since Wave broke onto the cloud accounting scene in 2010. Now years later, rave reviews from app critics and users have turned heads and made Wave one of the fastest-growing accounting apps of recent years. Wave's success has prompted some bold advertising aimed at QuickBooks Online (QBO), which is still the leading software on the market. Our curiosity got the best of us, so we put the two head to head in an app showdown! We'll compare some of the features that business owners value most to see which software suite is the best value. Accounts Payable – Both apps have Accounts Payable accounts, but only QBO offers Bill Pay options that can keep AP up to date daily. Bills in Wave cannot be paid automatically. They must be marked paid manually. Chart of Accounts – QBO offers industry-specific COA. Waves offers a generic but customizable COA. Bank reconciliation – The reconciliation processes are similar. Contact management – QBO allows you to import Excel or CSV lists of contacts, but Wave does not. Reports – QBO has over 100 customizable reports compared to Wave's 12. Wave has the one-two punch of being free and super streamlined which makes a great first impression. The appearance is clean and simple, and the menus are easy to navigate. Users new to online accounting will appreciate the ease of navigation. All the basic features are there to perform daily financial tasks, plus a few features unique to Wave. But let's get down to the nitty-gritty. 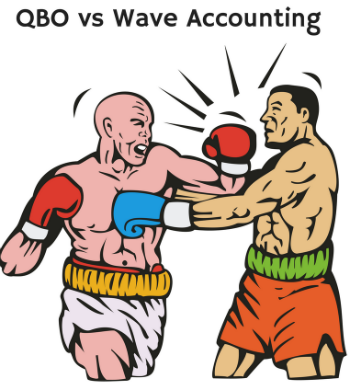 Other than being free... How does Wave really compare to QBO? Here's a list of its strengths and weaknesses. Unlimited Users – One Wave account offers access to unlimited users or collaborators. The original creator of the account is the administrator, and is the only account that has access to any banking information. All other users can be given permissions for viewing or editing information depending on their company role. Multiple businesses/ Personal - Unlike most other apps, Wave allows you to create multiple businesses under one account, which is pretty handy for companies and independent business owners with separate businesses/departments or multiple types of income. Wave also offers a Personal section of your account. The Personal tab includes an accounting system for tracking personal finances separate from business finances. When classifying transactions, users can move transactions between Personal and business to keep personal expenses off of company books and vice versa. Functional Mobile App Collection - That's right, not just one app, a collection. Wave offers mobile apps that handle specific functions rather than one mini version of their full software. The most popular of the Wave apps is Receipts by Wave. This app scans your receipts and turns them into expense transactions automatically by filling the receipt information into the expense form. This is a great time saver for entering expenses. Wave's other app, Invoice by Wave, is just invoicing plain and simple. You can create invoices, customize the templates, see when they are viewed or paid, and accept payments (for the applicable fees). Payroll by Wave is also available for iPhone if you use the pay-as-you-go Wave payroll service. No Inventory - Wave allows you to create a database of products or services that you can add to your invoices, but it has no inventory tracking. Wave support guides will tell you that you can create inventory asset accounts to track inventory, but it's really more of a workaround. Much of your work will still have to be done in spreadsheets. No class tracking - Wave only categorizes transactions by account. You cannot create any other classes to track and organize transactions. No Cash Accounting - Wave does not offer cash-basis accounting, and therefore no statement of cash flows. This may not seem like a big deal to some. But for other companies, this could be a deal-breaker. For companies who keep a constant eye on their cash flows, this is a major disadvantage. 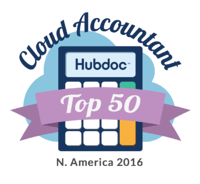 While Wave brings some great features to the market, there's a reason QuickBooks Online has been the top-selling accounting software year in and year out. QBO offers comprehensive sets of features for different industries and sizes of companies. Simplified forms make daily business tasks easy for someone with little or no accounting experience, making the software appeal to a diverse range of businesses. Let's take a look at some of the features QBO offers that have kept it ahead of the competition, as well as the features that have been a drag on the QBO experience. Inventory - QBO includes extra inventory tracking features for companies that have more complicated inventory, purchasing, and valuation. Class tracking - QBO offers both class and sub-class classifications for transactions in addition to the normal categorizations. This helps you keep transactions even more organized by tagging them with an appropriate class for tracking. Budgets - QBO offers Budgeting in some subscription levels. You can fill QBO Budgets in with prior years' data automatically, which saves a lot of time and allows for more accurate year-to-year comparisons. Phone Support - QBO offers phone support from Intuit representatives and ProAdvisors. Wave fans often point out that Wave's email support is more helpful and responsive than QBO's Support, which is notorious for being lengthy. However, there are sometimes when you just need to talk to a real person. When your situation needs a personal touch, QuickBooks has the phone support to help you with your questions. Integrations – QBO integrates with over 400 third-party apps, while Wave integrates with only 3. Limited Users - QBO limits the number of users from 1 to 5 according to the subscription level. While you can grant varying levels of permissions and different roles, this limit puts restraints on the use of the software for many companies. More user accesses are available, but for a fee. Slow Mobile App - The QBO mobile app is basically a mini version of the online software. This is useful, but also bulky and slow which discourages a lot of users from using the app to its full potential. Not to say that Wave doesn't have a lot going for it. The creators of Wave are creating solutions for a very specific market of business owners. Startups, independent business owners, small companies with straight-forward income and expenses – all of these users can get a great value starting out with Wave. The problem comes when the business starts to grow and diversify. If you're planning on expanding your business, or you've already developed into a dynamic multi-faceted business, you'll outgrow Wave quickly and have to deal with transferring all your data to a new system. Despite some of Waves great features, QBO still has a wider range of tools for diverse and changing companies. Even if your company plans on sticking to what works for a while, the extent of QBO's reporting and analytics can help you become more efficient and aware of your company's strengths and weak points. Wave does not offer the same reporting capabilities that help companies evaluate their performance. Though it's the costlier option, the range of tools at your disposal on QuickBooks Online is worth it to set your company on an upward trajectory and prepare for future growth.